Election results from all three of Portland, Oregon's largest suburban counties indicate a reaction against what has been called "Portland Creep," the expansion of the expansive light rail system without voter approval and the imposition of restrictive densification measures by Metro, the regional land-use agency. Portlanders in the three largest Oregon counties (Multnomah, Washington and Clackamas) have previously voted against financing light rail extensions, however the transit agency has found ways to continue the expansion and now operates five lines, with a sixth under construction. 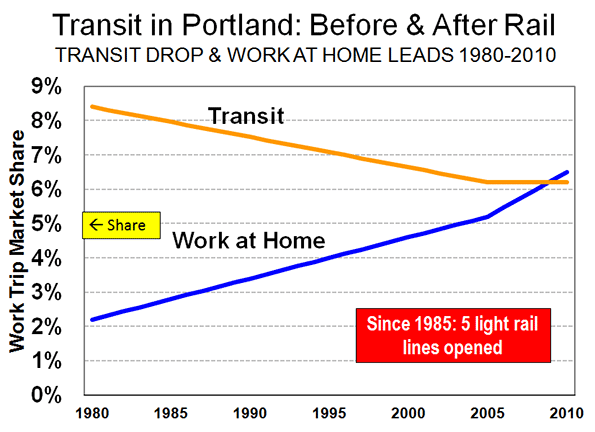 While urban rail aficionados tout the success of the Portland system, transit use by commuters has fallen significantly in relative terms from before the opening of the first light rail line. At the same time, working at home, which does not need billions in taxpayer subsidies, has caught up to and passed transit (Figure). The electoral events of the past 60 days could severely limit future expansion. In a September 2012 election, voters in Clackamas County approved a measure by a 60% - 40% majority requiring that any commitment of funding to rail would require a vote of the people. Perhaps fearing a negative result in the election, the pro-rail Clackamas County commission hastily approved $20 million to support the under construction Portland to Milwaukie (Clackamas County) light rail line. Things were to become substantially more difficult for light rail in the November election. In Clackamas County, the two incumbent commissioners on the ballot, both of whom voted for the $20 million bond issue, lost their seats. Voters rewarded their chicanery by replacing them with anti-rail commissioners, leaving the Clackamas County commission with a 3 to 2 anti-rail majority. The Oregonian characterized the election as "a referendum on light rail." "I think the biggest boost my campaign got was when those commissioners agreed to pay that $20 million to TriMet" for Portland-Milwaukie light rail four days before the September election. I think that put Tootie and me over the top." "Tootie" is Tootie Smith, a former state legislator who unseated commissioner Jamie Damon in the same election by a similar margin. Meanwhile, light rail has run into substantial difficulty in suburban Washington County. In September, voters in King City approved a measure to require all light rail funding to be approved by the voters. In the more recent November election, voters in Tigard, the 6th largest city (50,000 population) in the metropolitan area, voted 81%-19% to subject all light rail expenditures to a vote of the people. Portland's transit agency also had its eye on expanding light rail service across the state line and the Columbia River to Vancouver, in Clark County, Washington. The plan was to build a new "Interstate Bridge" (Interstate 5) across the river, which would include light rail. The voters of Clark County were asked in a referendum to approve funding for the light rail system and turned it down soundly according to the Columbian, by a 56% – 44% margin. But there was more. For some time, citizen activist and business leader David Madore has been working to stop both tolls on the new bridge and light rail service. Madore was elected to the board of commissioners of Clark County at the same time that the light rail referendum was being defeated. Madore, like the two other Clark County commissioners, also hold seats on the transit agency board. "The agency is steadily devolving from a transit district to a retirement and health-care center, with unsustainable fringe benefit costs that now far exceed the mere cost of wages." Submitted by mikello85 on Wed, 05/13/2015 - 11:56. Submitted by aileen123 on Sun, 05/10/2015 - 06:56.
held back by injuries near the end, Vick hits the jackpot and makes history, becoming the first black quarterback ever picked first in the NFL draft. The young man whose mother worked at a Super Kmart receives a $3 million signing bonus. Submitted by aileen123 on Thu, 05/07/2015 - 13:41. Submitted by aileen123 on Wed, 05/06/2015 - 03:19. It pops up in the headlines when a suburban mom kills seven others, including the kids she loves, but that’s a gory headline. The real story is a silent, utterly bourgeois, and hiding-in-plain sight problem: How a lot of American women are hanging right over a cliff. Submitted by aileen123 on Tue, 05/05/2015 - 05:13.
which all persons live together in harmony and with equal opportunities. It is an ideal which I hope to live for and to achieve. But if needs be, it is an ideal for which I am prepared to die." And then Mandela was found guilty, after an eight month trial. He would spend the next 25 years of his life behind bars. Submitted by aileen123 on Sun, 05/03/2015 - 03:58. The Indian public was thrilled and embraced this achievement as well as the Indian government and polio partners like the Global Polio Eradication Initiative. But in general, I think just the level of satisfaction and sigh of relief that people felt was something almost palpable. Submitted by abel672 on Thu, 04/16/2015 - 23:45. Submitted by abel672 on Wed, 05/13/2015 - 20:22. Submitted by victorsteels on Tue, 03/31/2015 - 12:36. Submitted by simplexfittings on Wed, 03/11/2015 - 05:40.